Ths document describes the standard formats adopted by the OGIP for the storage of the Radial Point Spread Function (RPSF) and Radial Encircled Energy Function (REEF) datasets, which describe the radial angular/spatial response of an instrument as a function of energy, and position. Intended audience: primarily HEASARC programmers & hardware teams. Within the HEASARC CALDB the term "Point Spread Function" (PSF) (or "Point Response Function", PRF) is used to refer to the spatial/angular spreading of incident photons from a point source caused by the instrument (mirror or optical system, and - optionally - the detector). In the most common and simple case, imperfections in the surface smoothness and shape of the mirrors result in incident photons from cosmic sources not being perfectly focussed on the focal plane. Thus the number of events detected as a function of position in the focal plane is not the idealized delta-function at the expected position, but has a characteristic shape (depending upon the optics and detectors in use) with a finite width. More generally, the PSF also can include spreading of events due to geometrical effects (eg obscuring structures, the detector surface not laying exactly on the focal plane, including coma), and effects within the detector (eg lateral charge-cloud drift in gas experiments), etc. Thus, generally a point-source at infinity gives rise to a 2-dimensional image of finite size. Within the HEASARC CALDB such a dataset is refered to as a 2DPSF, and the FITS file format for such calibration datasets are described in CAL/GEN/92-027 (George & Yusaf). In this memo we concentrate on Radial Point Spread Functions which give the source surface brightness as a function of radial distance from the focal point. These radial point spread functions represent the azimuthally-averaged values of the detected source surface brightness from a 2DPSF, centered on the nominal point of focus assuming an idealized optical path. In practice, the centroid of the 2DPSF is often used instead of the theoretical position of focus. Figure Figure 1: The detector plane in sky coordinates. N is to the top, E to the left. The optical axis is normal to the detector at the point marked by the ×, and the imaged source is represented by the blue circle. The off-axis angle θXMA and azimuthal angle ϕXMA are shown. The azimuthal angle ϕXMA is usually measured from north through east by convention. Radial Point Spread Function (RPSF) datasets; each element of which essentially describes the probability of an event (which was successfully detected by the detector) being detected at a position which lies within a given annulus centered on the theoretical position of focus. The dataset is normalized to either a single event (giving the true probability per unit area for each annulus - the prefered method for calibration datasets), or a given number of "total" events (giving the expected/observed number of counts per unit area for each annulus - often useful for observational datasets). Radial Encircled Energy Function (REEF) datasets; each element of which describes the fraction of the 'total' events (when integrated out to a large/infinite radius) contained within circles of increasing radii centered on the theoretical position of focus. Both the RPSF and REEF data historically have been referred to as radial point spread functions. However, for clarity, the HEASARC CALDB distinguishes the two. Detailed image reconstruction of non-point-source targets should use full 2-dimensional 2DPSF calibration datasets described in CAL/GEN/92-027 (George & Yusaf). The point spread function in general depends on annular distance R from the point of focus, the incident photon energy E, and on the position of the point of focus on the detector, usually given in terms of two angles, the off-axis angle (θXMA) which accounts for the dependence of the RPSF on the angular distance from the optical axis, and an azimuthal angle (ϕXMA), as shown in figure 1. When stored in a FITS file, both RPSF and REEF datasets consist of a 4-dimensional grid, with 1 axis giving the "radius" (R, the angular distance from the theoretical point of focus), 1 axis giving the photon energy (E), and 2 axes (θXMA and ϕXMA) defining the position relative to the optical axis at which each RPSF dataset is valid. The construction, format used (within the limitations discussed here) and delivery of the data to the HEASARC (including any updates) is the responsibility of the instrument team. However, below, are the recommendations of the HEASARC CALDB team based on our experience. Our emphasis is on "calibration" RPSF or REEF datasets (ie datasets which are likely to be used as "standard calibrations" by users and analysis software, and delivered to and stored in the HEASRAC CALDB). Consequently, a number of the issues discussed here and in the document as a whole are not applicable to datasets derived from non-calibration, Guest Observer observations. In both the case of RPSFs and REEFs, use of virtual calibration files are recommended (see Sections 1.3 & 4) for those cases where the point spread function can be adequately described by simple functional forms (gaussians, lorentzians, etc.). Prior to launch, the spatial/angular spreading of a point source is measured at a (limited) number of positions and/or photon energies during ground calibrations and/or modelled analytical (eg by ray-tracing) to characterize the PSF. In most cases these results can be parameterized and stored in a virtual calibration file (Sections 1.3 & 4). After launch, the pre-launch PSFs are usually checked and updated using a limited number of pointings of known bright point-sources (LMC X-1, Cyg X-3, ζ Pup, etc.) usually at a number of off-axis and azimuthal angles. Often the results from these observations can be parameterized such that a virtual calibration file (Sections 1.3 & 4) can be created. It is often possible to parameterize both a RPSF and REEF dataset for a given science instrument. In these cases the RPSF and/or REEF information may often be economically stored as a virtual calibration file, and an associated standalone s/w task (see CAL/GEN/92-003). Wherever possible, this is recommended. Virtual calibration files are discussed in Section 4. 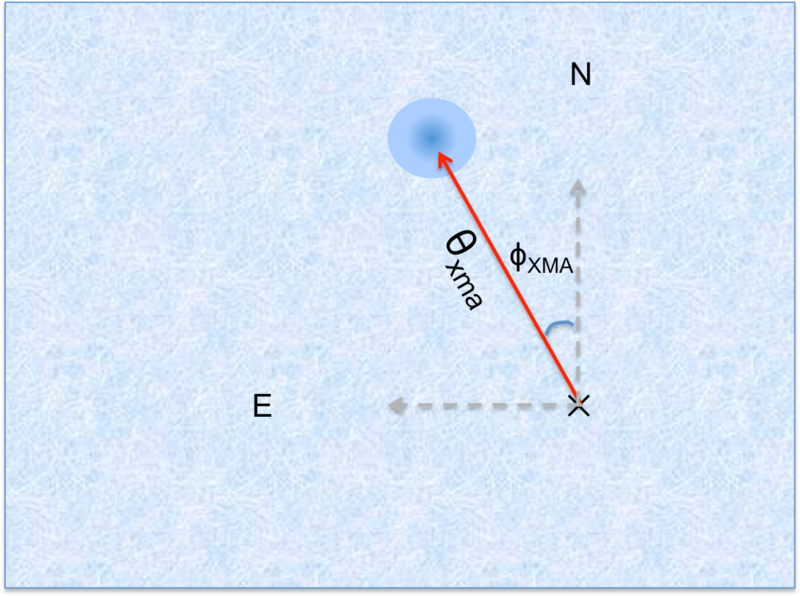 In the case of both RPSF and REEF datasets, interpolation between the θXMA,ϕXMA grid points is usually required for comparison with a pointed observation. Most often, analysis software will use a simple 2-dimensional linear interpolation when calculating the RPSF/REEF between θXMA,ϕXMA grid points. Thus the θXMA,ϕXMA grid should be of sufficient resolution to enable this to be reasonable approximation. As discussed in CAL/GEN/92-003, it is strongly recommended that the energy grid be of sufficient resolution such that interpolation of this parameter is not required. However, in cases where interpolation is required, as simple 1-dimensional linear interpolation may be performed, (which will clearly which may be inaccurate close to sharp spectral features (detector absorption edges, for example). - the name of the organization that defined this file format. - giving the HDUCLAS hierarchy for this format. These are valid for all datasets described in this section, and should be present in the header of the extension containing the RPSF dataset. Figure Figure 2: Plot of sample radial point spread function. The PSFs shown are approximated as gaussians with given standard deviations σ values as shown. The PSFs broaden as the source off-axis angle increases. Each PSF is normalized to unity. This format is currently still VALID. It was designed primarily for calibration datasets, but can be used for GO datasets. It was designed primarily for GO datasets, but can be used for calibration datasets. NOTE THAT THIS FORMAT WAS NEVER IMPLEMENTED, AND THUS WILL NOT BE DISCUSSED FURTHER. One file for each telescope/instrument combination containing a single BINTABLE FITS extension. The BINTABLE only has a single row, using arrays for the 8 necessary columns. Note: this format was formally known as RPSFVERS = '1992a', and is still occasionally refered to as such. TELESCOP - the name of the satellite/mission. Allowed values are given in CAL/GEN/92-011. INSTRUME - the name of the telescope mirror/detector assembly. HDUVERS = '1.0.0' - giving the version of the format. HDUCLAS3 = 'OBSERVED' - indicating the RPSF dataset has been generated from an observational dataset. HDUCLAS3 = 'PREDICTED' - indicating the RPSF has been generated using a theoretical model. TDIMnnn - the number of elements and ordering (see CAL/GEN/92-003) of each multi-dimensional array. Only the RPSF, AREA_WGT & (if present) the RPSF_ERR columns here (with nnn=7,8 & 9 in the example below). (see CAL/GEN/92-003 for further details). CREFnnn = The column referencing keyword for each multi-dimensional array. PIXSIZE - the angular size of (one side) of the pixels in units of decimal degrees. BACKGRND - the background count rate in units of counts per pixel (where the pixel size is definded by PIXSIZ). If no underlying instrument or cosmic background is expected, then a value of zero should be entered. ENERG_LO - the minimum energy (in keV) for which the the RPSF dataset was constructed or is valid. The value -99.0 indicates that the value is unknown. ENERG_HI	- the maximum energy (in keV) for which the the RPSF dataset was constructed or is valid. The value -99.0 indicates that the value is unknown. CHANMIN - the minimum detector channel number for which the the RPSF dataset was constructed or is valid. The value -99.0 indicates that the value is unknown. CHANMAX	- the maximum detector channel number for which the the RPSF dataset was constructed or is valid. The value -99.0 indicates that the value is unknown. SUMRCTS - the sum of the raw counts 'under' the RPSF dataset. Essentially the value of this keyword can provide the 'normalization' of an observed dataset. It is strongly urged that the RPSF supplied to the HEASARC CALDB be normalized to 1 count (ie SUMRCTS = 1.0). Rlow, a fixed-length REAL vector (array, each element within which is 4-byte) containing the lower radial bounds of the annular bins as measured from the nominal point of focus. The FITS column name is RAD_LO. The recommended units are arcmin. Rhigh, a fixed-length REAL vector (array, each element within which is 4-byte) containing the upper radial bounds of the annular bins as measured from the nominal point of focus. The FITS column name is RAD_HI. θXMA, a fixed-length REAL vector (array, each element within which is 4-byte) containing the off-axis angles. The FITS column name is THETA (but see below). ϕXMA, a fixed-length REAL vector (array, each element within which is 4-byte) containing the azimuthal angles. The FITS column name is PHI (but see below). Elow, a fixed-length REAL vector (array, each element within which is 4-byte) containing the lower energy bounds of the energy bins. The FITS column name is ENERG_LO. The recommended units are keV. Ehigh, a fixed-length REAL vector (array, each element within which is 4-byte) containing the upper energy bounds of the energy bins. The FITS column name is ENERG_HI. RPSF, a fixed-length REAL vector (array, each element within which is 4-byte) containing the RPSF measurement at each R,θXMA,ϕXMA,E grid point. The FITS column name is RPSF. The order of data storage is RPSF (R,θXMA,ϕXMA,E), where R & E represent the Rlow and Rhigh Elow and Ehigh arrays respectively (see below). The recommended units are per square arcmin. Awgt, a fixed-length REAL vector (array, each element within which is 4-byte) containing an area weighting factor at each R,θXMA,ϕXMA,E grid point. The FITS column name is AREA_WGT. The order of data storage is Awgt (R,θXMA,ϕXMA,E), where R & E represent the Rlow and Rhigh Elow and Ehigh arrays respectively (see below). These are summarized in Table 1. Table 1: Summary of the OGIP format for Radial PSFs (HDUVERS = 1.0.0). Description: Radial Point spread Function datasets (including errors, if required) as a function of radial angular distance from centroid, energy, off-axis & azimuthal angle. An alternate spatial coordinate frame may also be used (see text). The ordering of the columns is of course arbitrary, however that used here is recommended. The rules and conventions concerning the energy grid (Elow & Ehigh) given in CAL/GEN/92-003 apply. the values of the CSYSnnn keywords should be replaced by the appropriate string listed in CAL/GEN/92-003. and/or (if necessary) the THETA & PHI column names replaced by more suitable alternatives if a different coordinate notation is employed. In this case the CSYSNAME keyword is mandatory and should give the column names used (see CAL/GEN/92-003). Spatial coordinate frames cannot be mixed within a given dataset. (or corresponding alternate values of pname if a different coordinate notation is employed) along with any other limitations the authors of the dataset consider necessary. Datasets in which RPSF is independent of ϕXMA (or θXMA) should contain PHI = 0.0 (or THETA = 0.0) as a header keyword (or a corresponding alternate keyword if a different coordinate notation is employed). Alternative physical units are allowed for all columns of the table as long as they conform to the rules given in OGIP/93-001. The same is true for the physical units associated with the CBDn0001 keywords. The order of RPSF (Rad,θXMA,ϕXMA, E) whereby the radial parameters change fastest, and the energy parameters slowest was chosen to facilitate access for the most common applications: interpolation in θXMA,ϕXMA-space of RPSF vs Rlow,Rhigh arrays. This ordering is further confirmed by the value of the mandatory TDIMnnn keyword for this array (where nnn = 7 in the above example). An optional array containing the 1σ statistical error associated with each element of RPSF (if required) should be contained in an additional column named RPSF_ERR. These are valid for all datasets described in this section, and should be present in the header of the extension containing the REEF dataset. Figure Figure 3: Plot of sample radial encircled energy function. The REEFs shown are approximated as gaussians with standard deviations σ given as in Figure 2 above. Because the PSFs broaden as the source off-axis angle increases, an extraction cell of a given size captures less of the integrated flux as the source is placed at increasingly larger off-axis positions. Note: this format was formally known as REEFVERS = '1992a', and is still occasionally refered to as such. Only the REEF & AREA_WGT columns here (with nnn = 7,8 in the example below). Allowed values are given in CAL/GEN/92-003. ENERG_LO - the minimum energy (in keV) for which the the REEF dataset was constructed or is valid. The value -99.0 indicates that the value is unknown. ENERG_HI	- the maximum energy (in keV) for which the the REEF dataset was constructed or is valid. The value -99.0 indicates that the value is unknown. CHANMIN - the minimum detector channel number for which the the REEF dataset was constructed or is valid. The value -99.0 indicates that the value is unknown. CHANMAX	- the maximum detector channel number for which the the REEF dataset was constructed or is valid. The value -99.0 indicates that the value is unknown. REEF, a fixed-length REAL vector (array, each element within which is 4-byte) containing the REEF measurement at each R,θXMA,ϕXMA,E grid point. The FITS column name is REEF. The order of data storage is REEF (R,θXMA,ϕXMA,E), where R & E represent the Rlow and Rhigh Elow and Ehigh arrays respectively (see below). These are summarized in Table 2. Table 2: Summary of the OGIP format for Radial EEFs (REEFVERS = 1992a). Description: Radial Encircled Energy Function datasets (including errors, if required) as a function of radial angular distance from centroid, energy, off-axis & azimuthal angle. Datasets in which REEF is independent of ϕXMA (or θXMA) should contain PHI = 0.0 (or THETA = 0.0) as a header keyword (or a corresponding alternate keyword if a different coordinate notation is employed). The order of REEF (Rad,θXMA,ϕXMA, E) whereby the radial parameters change fastest, and the energy parameters slowest was chosen to facilitate access for the most common applications: interpolation in θXMA,ϕXMA-space of RPSF vs Rlow,Rhigh arrays. This ordering is further confirmed by the value of the mandatory TDIMnnn keyword for this array (where nnn = 7 in the above example). An optional array containing the 1σ statistical error associated with each element of RPSF (if required) should be contained in an additional column named REEF_ERR. Calculate the Radial Point Spread Function, RPSF(R,θXMA,ϕXMA,E) as a function of radius from the nominal point of focus (R), for a given off-axis position θXMA,ϕXMA and (range of) photon energy (E). The format of the o/p file should be one of the allowed data formats given in Section 2. Calculate the Radial Encircled Energy Fraction, REEF(R,θXMA,ϕXMA,E) as a function of radius from the nominal point of focus (R), for a given off-axis position θXMA,ϕXMA and (range of) photon energy (E). The format of the o/p file should be one of the allowed data formats given in Section 3. See CAL/GEN/92-003 amd CAL/GEN/92-013. The number and type of parameters specified depends solely on the requirements of the associated standalone task. Here we give an example of keywords used in files currently within the CALDB. WARNING: This dataset has a number of keywords missing. COMMENT   USING (USER DEFINED) MINIMUM COUNTS/BIN :    20. Information regarding on-line versions of any of the following references with an OGIP Memo number (i.e., documents starting OGIP/... or CAL/...) can most easily be found via the WorldWide Web by following the links from the HEASARC CALDB Document Library. Most OGIP Calibration Memos of general community interest have appeared as articles in the HEASARC journal Legacy. George, I.M. & Zellar, R.S., 1992. George, I.M., Zellar, R.S. & Pence, W., 1992. George, I.M., Arnaud, K.A., Pence, W. & Ruamsuwan, L., 1992a. George, I.M., et al., 1992b. On 4 Dec 2012, 11:58.